So, this is the second version of an illustration for Decagon. 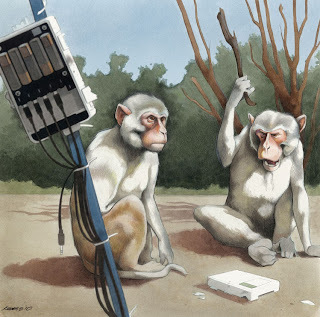 They wanted a group of primates (no species specificity) to be destroying a data logger. If you scroll down a bit, you should be able to find the first version. They liked the original, but said it was a little too funny and didn't quite fit with the tone of the website. They asked that the second iteration be a little more toward the realistic end of the continuum. I tried to give the illustration a bit more of a "National Geographic" feel. Not that the chimp using a power drill didn't have that feel, but this one is chock full of scienticity.